Nine Inch Nails have appeared on the latest episode of Twin Peaks: The Return. 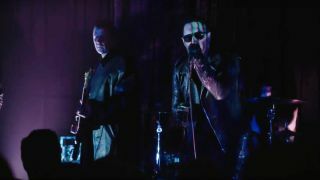 The eighth part of the David Lynch and Mark Frost series aired in the US last night, with Trent Reznor and co the latest band to appear on the Showtime programme. Artists including Chromatics, The Cactus Blossoms, Au Revoir Simone, Trouble and Sharon Van Etten have all previously appeared on the show, performing at The Bang Bang Bar, aka The Roadhouse, in the revived 90s series. Nine Inch Nails performed the dark Not The Actual Events track She’s Gone Away. It’s not the first time that Nine Inch Nails leader Trent Reznor and Lynch have worked together – Reznor scored the soundtrack to the director, screenwriter and producer’s 2013 film The Lost Highway, while Lynch directed the band’s video for Come Back Haunted the same year. Earlier this month, Reznor confirmed that Nine Inch Nails would release a new EP this summer to coincide with their planned live US dates. He said: “Did you know there’s a new top-secret Nine Inch Nails EP that will be released before the first shows we do this summer? “Did you know Not The Actual Events was the first part of a trilogy of related EPs that will be released about six-eight months apart? Nine Inch Nails will play four shows in 2017, starting next month in Los Angeles. Find a list below.